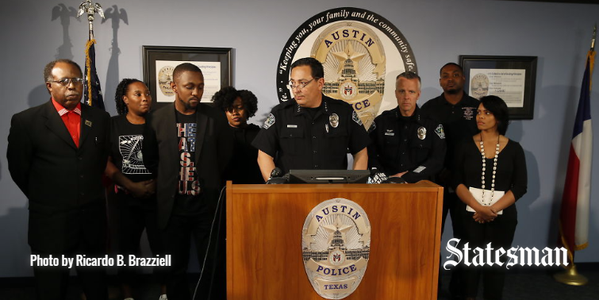 Last week a naked child was murdered in the street by a police officer in Austin, Texas. His name was David Joseph. There was public outcry – as there always is. The mayor promised justice and accountability. The police union defended the officer. One news outlet aired a report about how dangerous naked people can be. Now we are expected to wait, either for justice, or until this happens again. Hyperlinks aside, conjecture; what does justice mean in this instance, and how does this incident affect this all-too-common drama? Conjecture aside; a naked child was murdered in the street. Let that sink in for a moment. 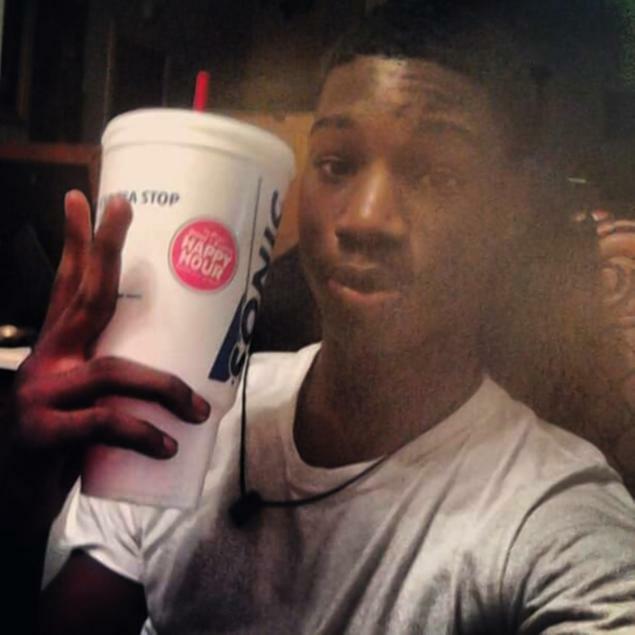 David Joseph was murdered in the street – a Black child of 17, in a city with the fastest shrinking Black population of any major city in the country. In Austin, the powers that be: the city council, planning department, police department and economic elite, have created a city where, by the numbers, Black people are not welcome. Furthermore, the city shows Black people they are not welcome when police murder their children, and the inflicting officers are never brought to justice. There is no shortage of interlocking elements to this story. However, it is unlikely that the policy makers or media will focus on issues that may bring justice or healing. This is deeper than an officer making a mistake – it illustrates the contemporary political movement Black Lives Matter. While BLM has brought police brutality towards People of Color to new heights of national media attention – we are still too often left without empowering solutions at the local level. It is important to be clear on exactly how and why this happened, so that we can determine a remedy. Perhaps the unique political and cultural history of our city can shed some light on this national epidemic . 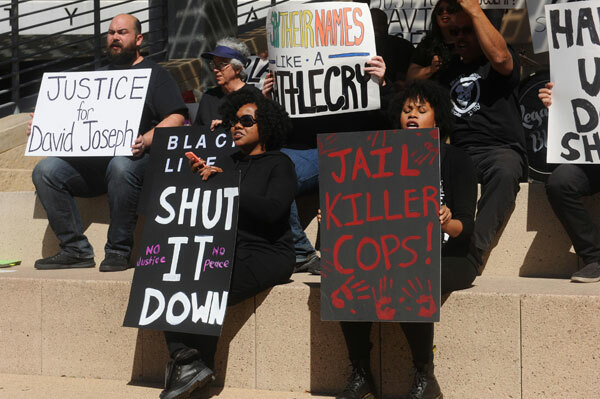 Austinites have organized for justice and police accountability for decades – recently groups have unified in addressing Joseph’s murder: the NAACP, Austin Justice Coalition, Black Lives Matter, Peaceful Streets Project, People’s Task Force and Undoing Racism Austin. There is room for this organizing to grow in numbers, visibility, policy and strategy; however, there is also a strong cultural current working against it – Institutional Racism. 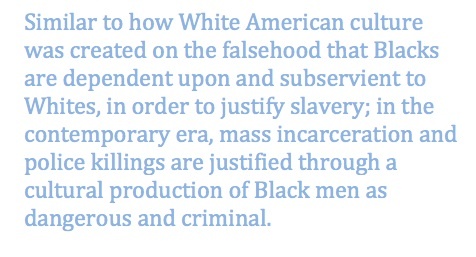 Similar to how White American culture was created on the falsehood that Black people are dependent upon and subservient to White people, in order to justify slavery; in the contemporary era, mass incarceration and police killings are justified through a cultural production of Black men as dangerous and criminal. Like all forms of racism, this is perpetuated at institutional, cultural and personal levels. The Police Union President, Ken Casaday, has been vocal in justifying the shooting of David Joseph, asserting, “Just because someone is naked and in the street does not mean that they are not a danger to someone. I would tell you they are an extreme danger,” and “A person’s naked, running around the street, can kill you. They can take your gun, take your taser because they have an unhuman strength.” [Grammar errors in the original.] Casaday alleges that naked people are even more dangerous than clothed people, assuming that they must be on drugs, which also cause violent behavior and give them superhuman abilities. This logic will be used in the officer’s defense, in order to establish their good judgment in using lethal force. That is all that will be asked of them. Our racist criminal justice system has upheld this rule each time the police murder someone in this city, and the narrative of the superhuman, violent naked black man is already being pumped out on the local news as a steady source of propaganda to cover the injustice of this murder. Casaday, through KVUE (the local ABC news affiliate) and KXAN (the local NBC affiliate), has now released a video of a naked Black man assaulting a police officer. Notice that this is not a video of David Joseph, but a completely different person in a completely different circumstance. APD used this tactic in 2009, when the community sought justice for the police murder of Nathanial Sanders, another Black youth. The police released a video of the altercation, showing a Black man lunging at a police officer and being shot. However, the man lunging forward was Sir Smith, a different man who was also shot at the scene, but not fatally. Sanders, who never exited the vehicle, was shot in the back of the head through the window. This video was used as public evidence to defend an officer with a violent record – justice was never served. The image of the naked Black man alongside structural violence is a deep structuring element of American Society. The auction block and the lynching – violent practices of White Americans subjugating African Americans, was dependent on the dehumanization of the naked Black male body. Considering policy for police to video record all interactions through dash or body cameras has implications here. The police will have no shortage of justification for any of their actions if they simply substitute one Black body for the next. The media is already happily serving up this historic legacy of collective punishment and dehumanization of Black men. As long as we allow the spread of dehumanizing propaganda, no amount of trainings, policies or cameras will mend this racist legacy. Overcoming the inherited violence enacted by both the police union and the news affiliate will be a cultural movement that refuses to yield the message that Black Lives Matter. Perhaps a good place for accountability to begin will be to ask KVUE and KXAN to not air such propaganda in the future (their contacts are here KVUE KXAN). As anyone savvy enough to navigate the comments section of online discussions will notice, Right Wing racists have had no shame in blaming David Joseph for his own death; thereby meeting the public exactly where they’re at. The police union has never committed to hold their officers accountable, even though to do so would, in fact, preserve the integrity of APD, and make the job of officers less dangerous. The police should strive for trust, not fear, from the public. A partial explanation to this utter lack of humility may be found in the Police Lives Matter marches, which in Texas have vastly outnumbered Black Lives Matter rallies. A recent example from Austin demonstrates how police are currently valued in our society. Brandon Daniel shot and killed police officer Jamie Padron in 2012. A struggle turned deadly when Daniel was caught shoplifting $57 worth of goods from Wal-Mart. Despite the clear lack of premeditation or likelihood to recommit, last week Daniel was sentenced to death. The precedent is simple – cop killers will be executed by the state. That is to say, police lives matter more than regular peoples lives. Furthermore, the fallen officer has since had an elementary school named after him. The system in multiple ways is upholding the reality that police lives matter a great deal – that is already the norm. The Police Lives Matter movement did not simply spring up as a reaction to Black Lives Matter, but is part of a long history of Right Wing nationalism in America. For many, the police represent the status quo and order, and their infallibility is a retrenchment of Right Wing nationalism, that refuses critique. Police Lives Matter serves as a public demonstration of allegiance to the historic dominance and political power of White America. The wealth and power of the ruling class of Austin, and the USA, was built and maintained through the exploitative subjugation of People of Color. Atrocities that should fill history books, perpetrated by the ancestors of those in power, are replaced by an imaginary history that passes for the truth. The ancestors of White America are National heroes who cannot be criticized; the Constitution is presented as a sacred document that cannot be criticized; the long history of violent displacement and human dispossession cannot be criticized – and so, unsure of history and the current predicament, people do not understand our issues and cannot resolve our problems. 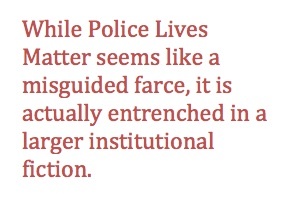 While Police Lives Matter seems like a misguided farce, it is actually entrenched in a larger institutional fiction. Conversely, a vocal fringe within the movement for police accountability called All Cops Are Bastards (ACAB) intersects seamlessly with police brutality defenders. ACAB calls for the abolition of the police, and squeezes insult to every police officer in the world into a 4-letter acronym. Unlike their Right Wing counterparts, their message is sorely distant from popular opinion and subverts meaningful movement towards justice. The assertion that anyone against police brutality is anti-cop is utterly juvenile, but ACAB plays into this narrative with disturbing ease. 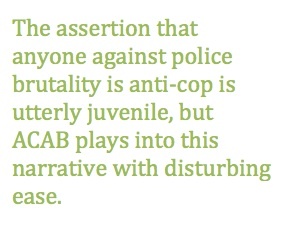 Most ACAB members are White and consider themselves anti-racist. However, they essentially follow the dominant narrative of a societal division with the police and order on one side, and People of Color and disorder on the other. This is likely why there is overlap with some of these activists and the extreme Right. The reality is that not all cops are bastards; the criminal justice system is racist – and these are two vastly different statements. Furthermore, the racist structures of society are much deeper than the police; they are the courts, media, schools, tax system and many other facets of government and civil society. The idea that the crux of justice and injustice is bound within the violent encounter, only perpetuates the hostile cultural climate where police are at odds with Black communities. Instead, we must realize that all communities, including African Americans, Police, and even Black cops, are damaged when we do not have simple mechanisms for justice and accountability. The truth is that this country was built by Black people for White people, who dehumanized them in order to justify their violence while maintaining their value system. Our current system continues with the value system and the dehumanization in tact. Police discriminatory extermination of Black youth serves to maintain the stratification of society. It is through this lens in which all cops are seen as bastards by the dispossessed – they are agents of death and inequity. However, the police are mere pieces of a much larger system, which remains hidden when people focus on only the police. Last Thursday, Mayor Adler addressed the community and spoke of justice and accountability. 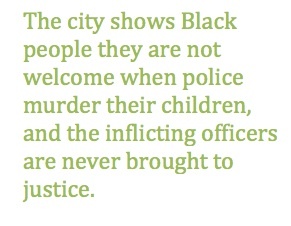 Many may be skeptical because we have heard these words before many times, and we have never seen justice in this city. How much accountability will we see if people do not admit their own history or address the whole system? In order to move forward, this community must establish a common set of values and adhere to them. To expect respect, we must show it. To expect justice, we must administer it. To achieve accountability, we must build it, one stone at a time. In this instance accountability and justice should mean an independent investigation, an indictment of criminal charges against the officer, an altering of policies that shield officers from justice, compensation for the child’s family, a renegotiation of the police union contract with community stakeholders at the table and accountability in mind, increased support for mental health facilities and first responders without guns, and resources for building community networks of neighbors who do not call the police on troubled youngsters. Austin has yet to commit to preserving the historic communities of the East Side, neither Black or Chicano. Justice is in development policy, too. It is in refusing to see Joseph’s murder as an isolated incident. Activists are now committed to hold both City Hall and APD accountable. The community deserves justice. We put people first. The collective we form will be one of unity for all peoples, and will reject White Supremacy enforced by the dominant society. The police are only a problem because the system they protect is a problem. A society based in equity and justice is the answer to police violence. Let’s build it! Previous Post10 Anti-Racist Actions for the U.S.A.